Newer versions of Outlook let you start in any folder in your profile. 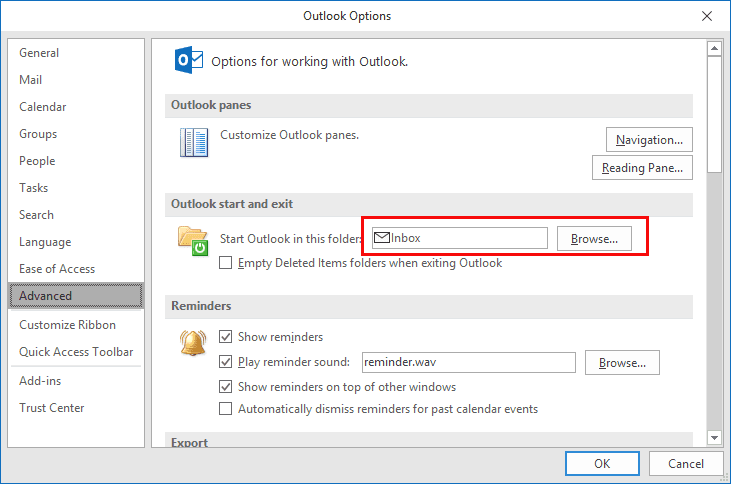 You can use this method to open Outlook with a non-default folder - this is especially handy if you want to start in a different calendar folder. In Outlook 2010 and up, choose your startup folder at the top of the File, Options, Advanced page. You can choose any folder type, however most people will select a calendar, their Inbox, or Outlook Today (select the mailbox folder). You can choose a Search folder in your default data file, but Outlook will not use a search folder in a non-default data file. You'll need to use a startup switch to start in a search folder in a non-default data file. In Outlook 2007 and older, go to Tools, Options, Other tab, Advanced options and change the startup in this folder setting. Click Browse and select any folder from the folder list. See Using Command Line Switches to Startup in a Folder below if your version of Outlook does not allow you to pick from any folder your profile. If your version of Outlook limits you to selecting folders in the default PST, you can use a command line switch to start in other folders. At Start menu, Run command (press Windows key + R to open), use the /select command as shown in the samples below, changing the folder path as needed. Outlook.exe /select "outlook:\\alias@domain.com\search folders\unread mail"
Browse for the folder you'd like. When I start Outlook 2016, I want both the mail and the calendar windows open. How can I do that? right click on the calendar folder, choose Open in new window then close outlook using File, Exit command. When you reopen it, both windows should open. On start-up, I want Outlook to open both my calendar and a calendar that is a separate "tickler" calendar that a former assistant used to track recurring reminders. Is this possible? No, not from that screen. If you don't start in the calendar, then all calendars selected (for side by side or overlay) when you closed outlook should be selected when its reopened. if she has either outlook 2013 or 2016, the folders, including the pst files, can be rearranged - just drag them up and down the list. if they won't drag, look on the Folder tab - is Show All Folder A-Z highlighted? if so, click once to turn it off. If you have an older version unfortunately you can't rearrange the folders. I need to know how to set Outlook to open in my gmail address inbox? I set it as the default acct. but it opens in the archives inbox instead. "c:\Program Files (x86)\Microsoft Office\Office14\OUTLOOK.EXE" /select "outlook:\\Public Folders – joe@domain.com\All Public Folders\Calendars\Joes Calendar"
Must I publish every calendar of every exchange-user to realise this...? outlook /select "outlook:\\Forum Replies\Calendar -cbut i can't set a specific view using a cmd line. Please tell me how I can get to the home page that shows the overview of the calendar, mail, and to-do list. I have it set up as my initial page but in order to get it back I have to close out my outlook and start it again. This is the worst set up for those of us who use this program for all the above at the same time. The old outlook let you organize yourself so much easier. I need the old home page back! To get back to Outlook Today at any time., click on the top level default folder. If you have one data file, it may have your email address in the name. In the video, its the one called Personal Folder at the top of the folder list. In Outlook 2010, it will have your email address but not the little house icon.